There are many misconceptions surrounding the role of teaching assistants in a classroom. Research has shown that effective partnership between teacher and TA can greatly benefit provision. It can be useful to conduct classroom observations that focus on a pupil’s behaviour and that enable the teacher and the TA to better understand the individual. strategies that seem to be effective. C: consequences – what happened afterwards (e.g. a warning or reprimand from the teacher, loss of a house point, moving into the ‘red zone’, another child getting upset) and how this affected subsequent working. what works best in preventing/addressing it. An important part of this process is talking to the child and gaining an understanding of their perspective. Parents/carers may also be able to throw light on the causes of unwanted behaviour. In one instance, impending divorce and regular arguments over breakfast resulted in significant emotional stress for a child in Year 6. He reacted by being angry – with everyone, about everything. Only by talking to the parents was this issue uncovered and eventually resolved. With careful thought, positive action may be taken straight away and can prove to be effective. Discussion and joint decision-making between the teacher and the TA about these issues will help to ensure a consistent approach. rewards and sanctions – these have to be relevant to the child, properly understood and consistently applied. There will often be more than one aspect of a child’s behaviour that needs modifying, but it’s important to prioritise. Address one or two aspects at a time. A behaviour plan, with SMART (specific, measurable, achievable, realistic, time-limited) targets can be drawn up with the child (and their parents/carers), and perhaps monitored by the TA. Providing behavioural support during lessons is an important part of the TA’s role. Establish a clear understanding between the teacher and the TA about responsibilities and parameters: the teacher is always ultimately responsible for the behaviour of the class, including the child with difficulties, and should never be undermined by support staff. The practice of the TA talking to a child while the teacher is addressing the class is not to be encouraged. It indicates that the child doesn’t need to listen, like everyone else – and it distracts other pupils. If further or a different explanation is needed, take the child elsewhere, or wait until the teacher has finished talking. an escalation of poor behaviour. 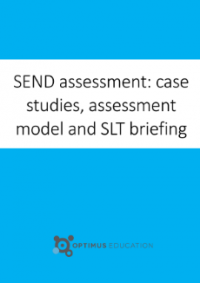 Download our free toolkit of case studies, assessment models and an SLT briefing to help you develop your strategy for SEND assessment.